Keeps Me Smiling: Should I Stay or Should I Go? Austism spectrum. Life-threatening food allergies. Heart conditions. Travel impaired? Hell no. This post is dedicated to families who have taken extra steps to get out and about, despite the additional work, risk, and sometimes anxiety. I tend get trapped in a definition of 'travel' as someplace new and adventurous. But the benefits of travel can apply to everyone, no matter how big or small the trip. Sometimes, something as simple as heading across town can bring a change of perspective, and a very appropriate travel opportunity. The photograph above is Leo. He is eight. 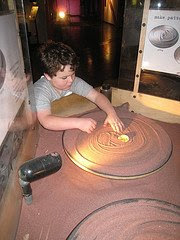 He and his family were able to have a fantastic time together at the San Francisco Exploratorium because the museum hosted a special event called Autism/Aspergers Family Night. Here is how Leo's Mom felt about the evening: The event was fantastic. Leo and the girls frolicked. I was floored -- and so, so grateful. I've never seen a non-autism organization put so much effort into meeting the needs of my son and his friends. My faith in humanity has been restored. This is Noland. He is two. This month he got to see lots of trains, first at Legoland, and then real ones at Roaring Camp in the Santa Cruz, California mountains. They had to pack his food, and steer clear of any peanuts headed his way, but it turned out to be a roaring success! Here is the email from Noland's Mom when they returned: Train ride was worth it...Noland loved the steam train! We had a big adventure day. We did the 11am steam train through the mountains. Of course the family across from us pulled out their emerald nuts and the lady next to me ate a snickers bar but we shielded Noland and he loved the experience. This is Krista. Based on what the doctors said when Krista was born, we weren't sure she'd make it out of the hospital. 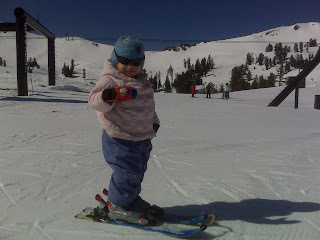 Krista is two, and she already knows how to ski. Here is what Krista's Mom had to say once she got up on skiis: Krista was pretty fired up to get her first turns in at Squaw this weekend! She had gotten really tired of dropping off the sisters to go skiing and being left out of the fun, so I decided it was her turn. She got 6 runs in on the beginner lift at Squaw and is still beaming! She made Jan put her skis and poles right next to her when she took her nap later in the day! I do not understand what it must feel like to manage these circumstances. But I know what I can do - I can provide support and encouragement at every opportunity. Happy travels, to ALL. 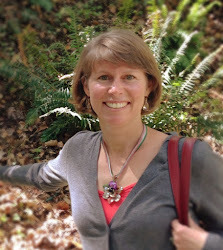 And thank you, Debbie Dubrow, for giving travel photos a voice on Fridays. What an awesome post!! I did some research on Legoland, since I was writing my guidebook, and they have some peanut free restaurants there. Here's the link http://www.legoland.com/park/Dining/dietaryconcernsmenu.html . I thought it was cool that they did that! Great idea. I'm sure families will benefit from your encouragement to travel despite challenges. What a great post. My sister-in-law's son is autistic and it pains me the way they treat him as 'special' and do so little to go out, because they are scared he'll 'do something'. once we convinced them to go to the zoo, and he behaved beautifully and had the time of his life!!!!!!!!!!!! my husband and I felt great that we could show them that he's a normal boy. It's completely, totally awesome that these families travel together, despite the troubles this may present. Traveling with kids is never easy, but traveling with kids that have special needs is even more so. And it's great that the museum did that special event, more family attractions should follow suit. The photo of Nolan looking at Thomas is great. The full size Thomas (steam engine) was here at the Greenfield village recently. The Museum was packed with kids for all 4 days. Nice post to encourage folks to meet the challenges of traveling to reap the benefits. We just took our 5-year-old with Aspberger's to Disneyland and had a great time. He enjoyed the place in his own, unique way; which is to say that we spent a lot of time walking backwards over all the bridges (to recreate a Thomas story) but that's just how we roll. this is great! i wish something like this was here because i have a friend who has a kid with the same special needs too. it made me smile the way a lot of people seem to care these days about the spectrum. Great post, Lorraine! I used to work with developmentally disabled children, and I remember how people would have to suddenly leave the park or wherever we were upon our arrival. It was sad. As Marina commented, it was if they were worried their actions would cause the children to "do something". It is incredible that you've highlighted their beauty and spirit. Thanks for that. Thank you for this amazing post. It is so reassuring that I'm not the only parent stressing about the simple task of a daily outing with my son who also has life-threatening allergies. I know it can be done and be done safely. Just releasing that anxiety is the toughest part as a parent. I'm so happy to have stumbled upon your blog today!